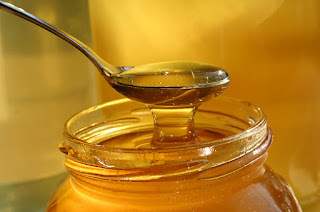 9 Homemade Recipe for Honey. ~ CK Jacob: Nigerian Fiction And Lifestyle Blog. 1. Lemon-Honey: Cold Here is a recipe with honey and lemons that can ease fever and chill symptoms associated with a common cold. 2. Ginger-Honey: Sore Stomach. Combining ginger with honey in this recipe makes it ideal for an upset stomach. 3. Honey Heel Moisturizer: Dry, Cracked Heels. A recipe combining honey, milk and orange to aid dry cracked heels. 4. Honey and Yogurt Face Mask: Acne. Mixed with honey this mask will also boost the anti-inflammatory properties for combatting acne. 5. Honey with Coconut Water Drink: Sore Muscles. This drink includes citrus and honey that together boost energy. 6. Honey And Sugar Cream: Athlete’s Foot. Honey and sugar works together in this paste to minimize the fungus associated with athlete’s foot. 7.Honey And Lemon: Weight Loss. A simple recipe combining honey, hot water and lemon. 8. Honey And Orange Juice: Anxiety. Orange mixed with honey is great for fighting anxiety. Eating pineapple and drinking honey helps reduce smoke craving. I hope you learnt from this. i will try the no4.